Taking inspiration from the life of Gandhi, Carnegie Mellon students from OM, a campus organization for Indian spirituality and culture, worked with the Pittsburgh nonprofit Moving the Lives of Kids Community Mural Project (MLK Mural) to create a mural of Gandhi on the side of Indian restaurant Coriander in Squirrel Hill on Sunday. 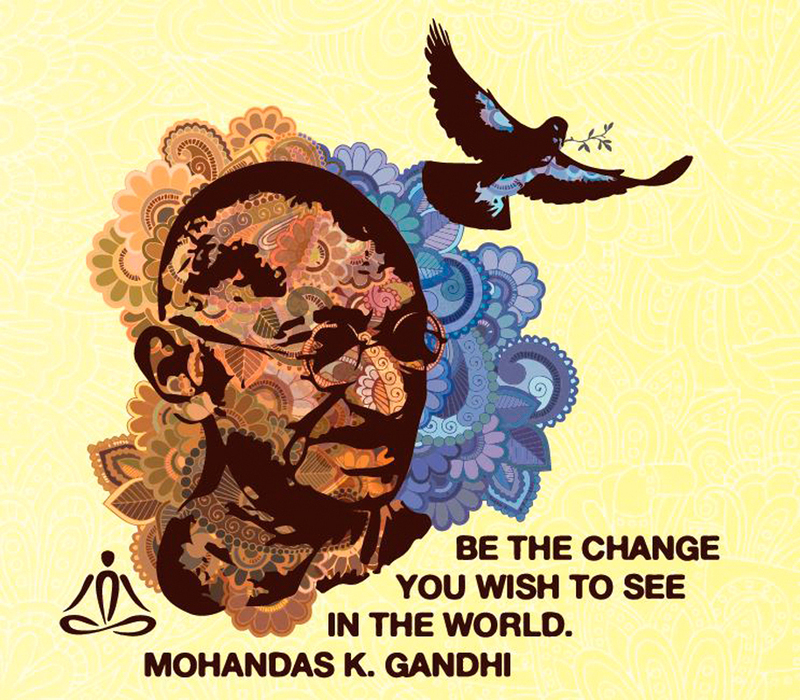 The mural is the grand finale to the Two Weeks of Peace and Gandhi’s birthday celebration that occurred all over campus through service projects, free hugs, lectures, and a screening of the film Gandhi in McConomy Auditorium. “Initially we wanted to make it a service project by working with a student group, but we decided instead to make it an event for OM and CMU students to do to celebrate the end of Gandhi Week,” said sophomore electrical and computer engineering major Divya Kothandapani, who coordinated the mural painting. The design for the mural was chosen through a contest by OM that sought submissions from talented Carnegie Mellon students. The winning design was submitted by senior art major Adelaide Cole, who was inspired by the intricacy of henna designs, the Indian art of ink-drawing on hands. Cole chose to use color symbolically, with orange fading into blue to symbolize the unity of people: She described orange as representative of the universal skin color, while blue is a symbol of peace. MLK Mural is a Pittsburgh-based group of people who identify as both artists and community organizers. Through mural painting, they reach toward the goal of community progression by strengthening and bringing communities together. Over the last six years, MLK Mural has created over 260 murals in Pittsburgh alone, including 13 this past summer. It’s an impressive feat, but more impressive is the number of young people that have been involved in the projects, which is well over 5,000. A delicious lunch was provided by Coriander and a rough sketch of Gandhi was well under way — the energy grew as local kids and volunteers eagerly picked up paintbrushes to join the effort. Editor's note: Adelaide Cole is a staff artist for The Tartan.